Can bacteria-induced, hybrid poplar tree farms located on Superfund Sites be used to produce energy from biomass safely, and more efficiently than if we were to continue using corn to produce ethanol? 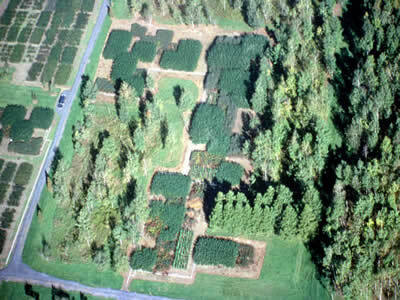 Will the poplars be able to grow on the depleted and contaminated soils of Superfund Sites, simultaneously cleaning up contamination through phytoremediation? 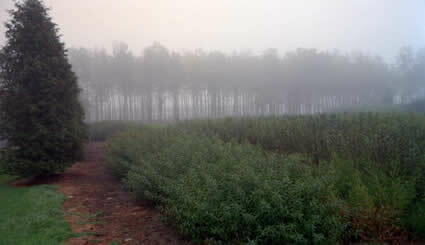 Genetically modified poplar trees have been among the plant life studied for its capacity to be a fast growing, high yielding source of biomass. The very fact that the trees would be genetically modified makes them a less attractive choice for energy crops, especially for policy minded people aware of the ongoing controversy surrounding GMO crops and their ability to cross fertilize with other plants. In this groundbreaking topic for debate we look at how bacteria strains, when induced into non-GMO poplar clippings, have been shown to accelerate the growth of trees, possibly making bacteria-induced poplars a valuable source of biomass. We'll look at whether this manner of cultivating poplar farms for biomass will be a balanced one. What adds significantly to the reasoning behind the science is that the hybrid poplar tree farms would be situated on Superfund Sites, and through a process called phytoremediation would effectively clean toxins from the environment as they grow. The Biomass itself = contaminated? Sugars in edible parts of plants (e.g. corn) have so far been most easily converted to ethanol at ethanol refineries; they have in relative terms also provided the most cost-efficient means of producing ethanol, however, arguably not the most environmentally friendly means. The more cumbersome to extract and manipulate sugars in the walls of nonedible plant parts (e.g. corn stalks), continue to pose a challenge to the ethanol refining process, which it is hoped will be overcome so that the cost to produce what is referred to as cellulosic ethanol becomes more competitive. Advanced technologies are being crafted to assist in the affordable conversion of lignocellulosic, or nonedible, plants and fibers. The location of the test site from which this science was produced was a greenhouse at the University of Georgia’s Savannah River Ecology Lab (SREL), at the Savannah River Site (SRS). SRS, a large Superfund Site, has been on the EPA’s National Priorities List since 1989. Today, there is an ongoing clean-up effort to undo all of the environmental damage done on the 192,000 acre site since refining of nuclear weapons began there in 1951, and nuclear spent fuel began to be stored there. Also at SRS, a controversial nuclear reprocessing facility, known as a mixed oxide (MOX) fuel fabrication plant, is currently under construction, it would be the first operational MOX plant of its kind in the United States. Adam Hoffman, a University of South Carolina graduate student, conducted the study involving Enterobacter s sp. 638, as well as other bacteria strains, at SREL, under the supervision of Dr. Lee Newman, who is now at Brookhaven National Laboratory in Upton, New York. Enterobacter s sp. 638 was first discovered by another member of Hoffman's team at the University of South Carolina's microbiology lab to have promising growth promoting properties when added to trees growing atop trichloroethylene contaminated groundwater. The trees used for this portion of the study are known hyperaccumulators. That is, they are able to absorb large amounts of toxins from the environment. In this case, what was absorbed was trichloroethylene, a very common and volatile hazardous waste found at Superfund Sites. The data Hoffman's lab partner found from several strains of bacteria, including Enterobacter s sp.638, was shared with Dr. Newman, who instructed Hoffman, her graduate student, to conduct the next stage study at SREL, which involved studying the effect the bacterium has on the growth rate of trees in marginal soils, including varieties of hybrid poplars. Enterobacter proved to be the bacteria that consistently caused hybrid poplars to grow most rapidly, over several other chosen bacteria strains that also showed growth promoting properties. Biomass from bacteria-induced poplar trees would be considered a cellulosic feedstock, or energy crop, used to make cellulosic ethanol, or potentially, an advanced biodiesel. This form of biomass shouldn’t require as much energy input up front, particularly since it likely won’t require fertilizer, and definitely not pesticides, to grow the trees, and irrigation methods will differ from those used to irrigate crops. Conceivably, according to Hoffman, in the conversion process there would also be less nitrogen emitted from the trees than is emitted from corn. There again would be the added benefit of carbon sequestration from poplar tree farms on plots of land that otherwise might not see the same amount of plant growth, given the barrenness and state of abandon of many Superfund Sites. *Cogeneration (or combined heat and power (CHP) that recycles ‘byproduct heat’ from plants to produce an efficient local energy source), and pending plant infrastructure changes that would require the input of biofuels versus fossil fuels to operate, may help alter the dynamics once again, but until then, cellulosic ethanol from forms of biomass other than corn (e.g. switchgrass, corn stover, and wood products) has become an important point of focus, as have biodiesels (derived from oils and fats) and second generation biofuels (e.g. Amyris Advanced Renewable Fuels; which involve the bioengineering of microorganisms, or synthetic biology). Part of the brilliance behind this scheme to create alternative energy is that the trees are to be grown on Superfund Sites where they can be used for phytoremediation, which involves the plant’s biochemistry taking up or absorbing heavy metals and contaminants, like trichloroethylene, toluene, benzene, and ethylbenzene, from the soils and ground waters in which they grow. An objective of big agrochemical businesses, the United States Department of Energy, and farmers alike, in recent years, when the price of crops used for biofuels was driven upwards, and the push for alternative fuels reached a new high, was to increase yields of crops like corn, soybeans and sugar cane. The ongoing effort to improve yields globally includes the heavy use of pesticides. Grafting was once described to me as the splicing of genes, and is a means by which one creates hybrid plants and trees. It is not a controversial practice, such as the engineering of genetically modified organisms. GMOs involve manipulating the DNA of an organism in a laboratory to create a variation of it that becomes a manmade good. Scientists insert portions of genetic code that alter so far untouched code, or create cross-sections of code, with a specific intent in mind. Opponents of GMO crops believe altering nature in such a way will negatively effect the natural functioning of environment and species, as the crops are planted outdoors, opposite non-GMO fields, where cross-pollination can occur; there are too many unknowns. Grafting, in its simplicity, is a means of asexual plant propagation, or the practice of joining clippings of two or more plants (usually trees, fruit trees, or shrubs) so they will grow in unison forming a plant anew. Poplars are frequently grafted since they are very fast growing trees used for making wood products and plywood, and restoring the environment through phytoremediation. According to the Segal Ranch Hybrid Poplars web site, poplars can grow 60 feet in six years and produce four to 10 dry tones of wood per acre per year. Unfortunately, we don’t know what amount of Enterobacter s sp. 638 bacteria added to trees can potentially cause environmental toxicity down the road, or the degree to which accumulated amounts of this bacterium may be deposited into plant roots, soils, surface waters and ground water, nearby tree farms. However, based on initial findings, the scientists responsible for the study believe the added bacterium will have an insignificant affect on the environment. As well, while Enterobacter s sp. 638, when compared with other bacteria strains in the study, causes poplar clippings (Populus deltoids x Populus nigra DN-34) to grow the fastest, it appears to not be as strong of a cleaning agent as a less popular choice of bacteria, nor does it have the same built-in controls that prevent inhibition of plant growth, as does still another choice. 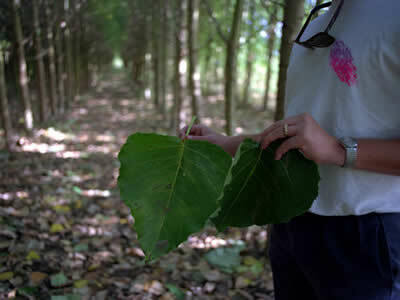 To promote the growth of trees, Enterobacter s sp. 638, produces acetoin, which converts to 2,3-butanediol, also known as, diacetyl. While diacetyl’s exact role in helping poplars grow, and the degree to which it is present in mature trees, are not known, the compound has been in the news in recent years. When heated and inhaled for long periods of time, it is known to cause an incurable lung disease, bronchiolitis obliterans. The only answer for those stricken by the disease is to have a lung transplant. Diacetyl is a common addition to microwave popcorn, butter, margarine and chardonnay, and in 2004 and 2005 two workers at popcorn factories in Missouri were found to have the terrible lung disease. At butter flavoring factories in California, a number of male workers who didn’t smoke and were young and healthy when they became ill, were also diagnosed with the disease. Reports and studies have also circulated indicating workers and consumers exposed to lesser amounts of diacetyl are still at risk of becoming sick with asthma, pneumonia, fibrosis and other health impairments. Last but not least, scientists debate whether it is better for the environment, and more cost-efficient, to grow a variety of native species on Superfund Sites, if they are also good at phytoremediation and can grow in marginal soils. The alternative is to grow nonnative species known to take up, or hyperaccumulate, organic compounds such as toluene and benzene, compounds considered hazardous to health when present at levels above the standard set by the Environmental Protection Agency. In the case of hybrid poplars, since the roots of the trees can literally reach down to the ground water and absorb liberal amounts of liquid, the trees could potentially draw down the water table. At the same time, by reaching and absorbing groundwater contaminated with a common pollutant such as trichloroethylene, the trees should be able to reduce a pre-existing public health concern. Hall, Mike. “House Acts After Bush Refuses: Dangerous Chemical Jeopardizes Workers.” AFL-CIO Now Blog, News. 1 Oct 2007, AFL-CIO. 9 Mar 2009. <http://blog.aflcio.org/2007/10/01/house-acts-after-bush-refuses-dangerous-chemical-jeopardizes-workers/>. McKinley, Jessie. “Flavoring-Factory Illnesses Raise Inquires.” The New York Times. 6 May 2007, The New York Times. 9 Mar 2009. <http://www.nytimes.com/2007/05/06/us/06butter. html?_r=1&ei=5087%0A&em=&en=a40b9580fc2767ce &ex=1178596800&pagewanted=print>. Taghavi, Safiyh, et al. "Genome Survey and Characterization of Endophytic Bacteria Exhibiting a Beneficial Effect on Growth and Development of Poplar Trees." Applied and Environmental Microbiology 75.3 (2009): 748-757. “Plant Sugars Provide Petrol.” Science News, The Naked Scientists: Science Radio and Science Podcasts. 21 Sept 2008, The Naked Scientists. 8 Mar 2009. “Researchers derive ‘green gasoline’ from plant sugars.” University of Wisconsin-Madison News. 18 Sept 2008, University of Wisconsin-Madison. 8 Mar 2009. <http://www.news.wisc.edu/15627>. If in response to Decision '09, The Science Debates you would like to have your comments posted, please submit them to yashahusain@gmail.com. Yasha Husain. Copyright 2009-2013. All Rights Reserved.